Before I begin, a disclaimer. I have no freakin’ clue how to grill a pizza using a gas grill. I’ve never tried it and aside from the convenience factor, I’m not a fan of gas grills at all, so I’m sorry, but I can’t provide those instructions here. The biggest challenge I’ve faced in making grilled pizza is in creating a technique that produces a good, consistent result. The crust should be crisp and light without drying out or getting overly charred. I’ve burned pizzas before, and I’ve messed around with a too-cold grill, on which the dough took seemingly forever to bake up into a crust. The original method I tried called for these basic steps, which I’ll treat lightly here just to show why this method didn’t work for me. Build a two-stage fire, with coals banked to one side of the grill. Brush oil on the grate on the not-so-hot side of the grill. 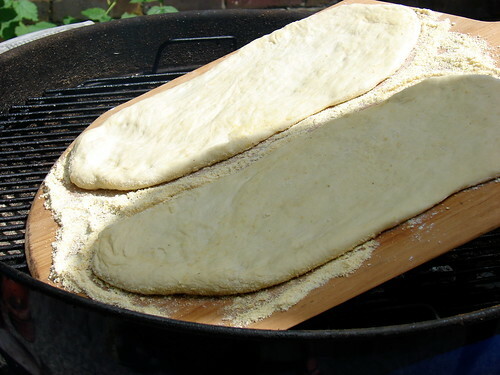 Place your shaped dough onto the grill, cover the grill, and bake the crust until it firms up. Flip the crust so the grilled side is now up. 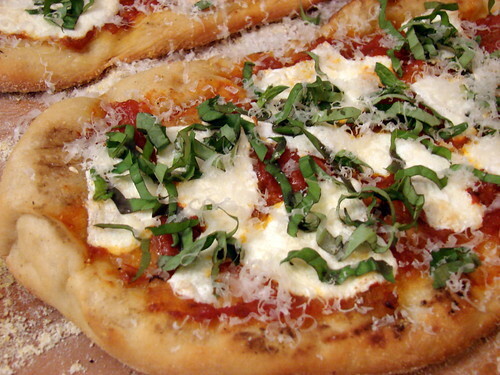 Brush olive oil on the crust and build your pizza, directly on the grill. 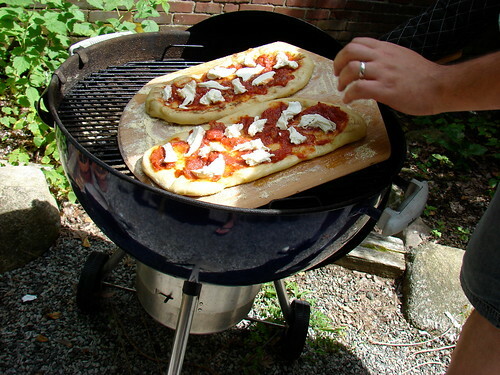 Cover the grill and bake the pizza until the cheese melts and begins to brown. When you do that, your crust is continuing to bake, and you’re working directly next to some very hot coals. You have to work fast to build your pizza a) before your crust burns, and b) before all the hairs on your arm singe off. It’s uncomfortable and it’s frustrating. So frustrating in fact that for a month or so last summer, I just stopped grilling pizza. I was Done. But now I have a better method, and all is right again with the world. Before I share that with you, though, I need to rewind because I didn’t address shaping the dough in my doughy post earlier. 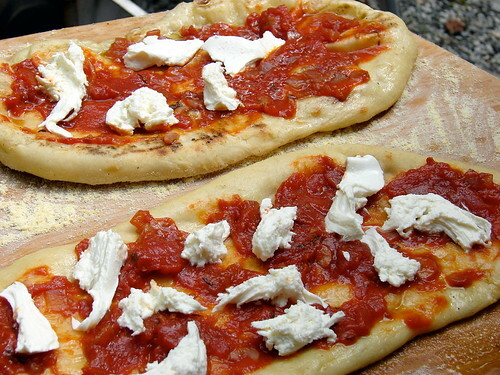 Two hours before you plan to shape the dough, remove the dough from the refrigerator. (If you’re working with frozen dough, be sure to give it ample time to thaw. I like at least a day.) Allow the dough to approach room temperature. After two hours have passed, shape the dough. How you do this is really up to you. Peter Reinhart, in The Bread Baker’s Apprentice, describes a technique similar to what you’ve seen in pizza parlors, where you lay the dough across your knuckles and gently stretch it into shape, lightly tossing it into the air as you go. I do that at first, but then frankly, I lay it across a floured surface and use a floured rolling pin to finish. Regardless of technique, what you’re looking for is a thin dough in which the dough is starting to windowpane. If you hold the dough to the light, you should see light shining through the thinnest portions. As for shape, think rustic. I don’t even attempt to get a round crust. Mine are roughly elliptical, roughly rectangular. If counter space is at a premium for you, as it is for us, lay a piece of plastic wrap/clingfilm across the shaped dough. 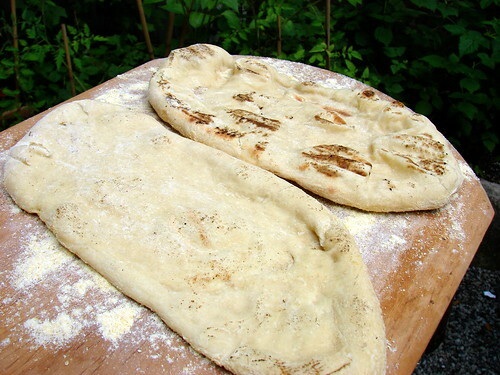 Fold the dough up and set aside. Using your fingers, shred some fresh mozzarella (or prepare whatever cheese you’re using–gorgonzola, whatever). Pour some olive oil into a small bowl and place a silicon brush nearby. 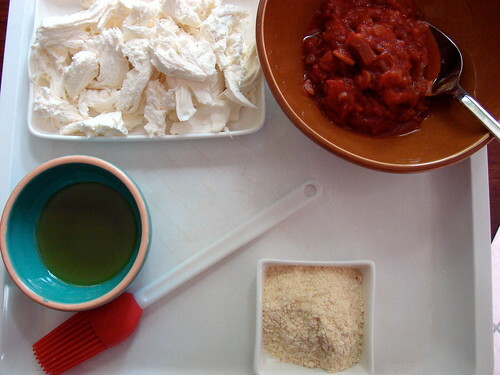 Put your tomato sauce, or sliced/crushed fresh tomatoes, into another bowl. Chiffonade some fresh basil (but leave it inside, in the kitchen). Have some parmigiano or peccorino cheese handy (but leave that inside, too). The other two things you need are a pizza peel and some cornmeal. 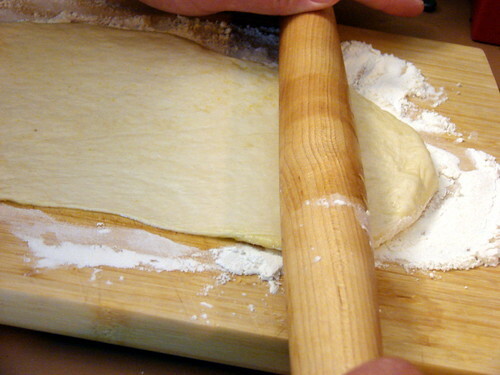 To assemble your pie, unfold the rolled-out dough onto a peel onto which you’ve sprinkled cornmeal. 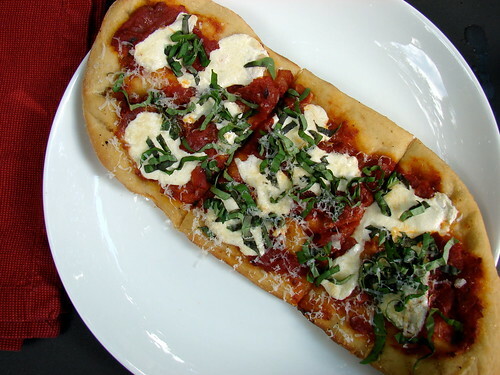 Place your bowls of olive oil, tomato sauce, and cheese onto a platter or tray. Build a fire. We have a 22-inch Weber One Touch charcoal grill. (And let me repeat, I’ve never grilled a pizza over gas, so I have no idea how to provide those sorts of instructions.) I fill a chimney with lump charcoal of various sizes and use Weber paraffin cubes to light the chimney. After the coals are lit and are beginning to ash over, I dump them onto the far side of the grill, to build a two-stage fire. I place the grate on and lid up the grill until the grate heats, about five minutes. Once the grate is hot, if it’s still schumtzy from a previous cook, I take up a ball of foil in my grilling tongs and scrape down the hot grate. Then I replace the lid and let the grate heat up again. Jen, at this point, brings the tray of topping out, along with the peel o’ dough, and places everything onto an outdoor table. I remove the grill lid and oil the cooler side of the grate, using the silicon brush. With the exact motion I use to slide dough onto a pizza stone in the oven, I shimmy the dough onto the oiled grate and lid up the grill. It’s important to stress, this is untopped dough. You’re basically parbaking the crust at this moment. 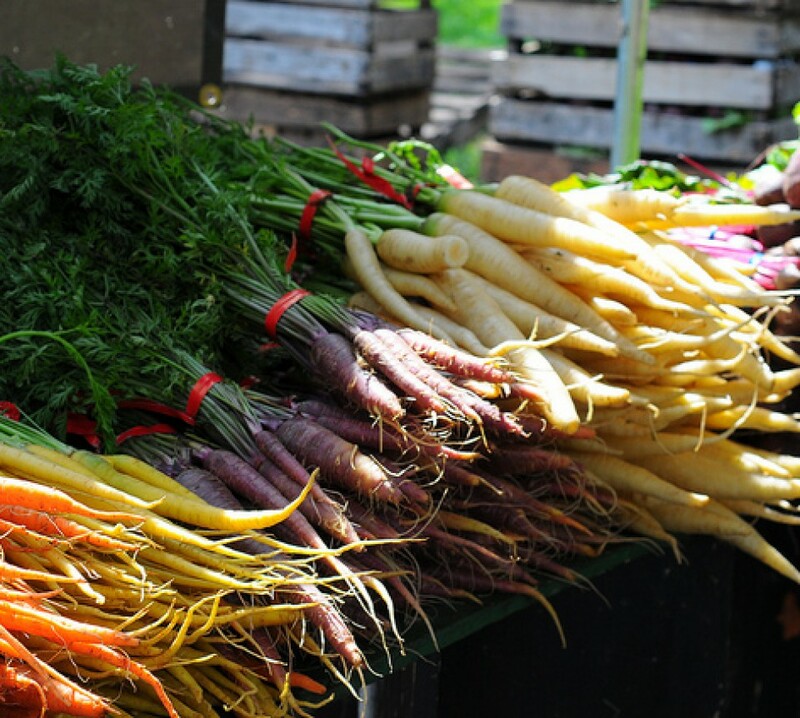 Leave the peel handy on the table; you’ll need it again shortly. (You might keep cornmeal on hand if you need to sprinkle more onto the peel.) Check on your crust every minute or so. You’ll know when it’s crisp enough to remove–this usually takes no more than five minutes. Now, this part is tricky. Using two pairs of tongs (and having a partner standing by with the peel), remove the crust from the grill and place it grilled side up on the peel. Lid up the grill again so the grate reheats. Build the pizza on the peel, on the table. Don’t overdo the toppings! Less is more with grilled pizza. Lightly brush some oil onto the crust, but not too much. Spoon on tomato sauce in a thin layer. Finally, dot the surface with cheese. Lightly oil the grate again, and then shimmy the pie carefully onto the grill. Lid up. You want to cook until the cheese starts to bubble; it’s hard to give you a precise time. It depends on your grill, your charcoal, the alignment of Mars, how the Mets are doing, etc. Because you’ve parbaked the crust, you’re far less concerned with what the crust is doing, and more interested in the toppings. Just don’t let the crust burn. If the bit that’s closest to the fire is starting to char, you might use tongs and gently rotate the pie. When the pizza’s done, you’ll need a friend handy again to help you remove the pizza off onto the peel. Sprinkle basil on, lightly, and grate the parm or peccorino over the top. Slice and enjoy! I enjoyed your post. I make grilled pizzas on a gas grill. They cook up really fast and I find you cannot use large or wet toppings because the crust will burn before the toppings cook/get hot. So I make them very thin with a minimum of stuff on top. We do carmelized onions thinly spread with parmesan cheese. I have also done cherry tomatoes and very small pepperoni. Last week, I had some lefover gruyere so I shaved it into thin pieces and topped it with sage leaves. It was great although arguable not pizza. My husband has made me a die hard fan of charcoal grills. I think the best part of grilling a pizza over charcoal, besides the crispy crust, is the smoky flavor. Epic post, Jen, thank you. am NOT going to try this at home 🙂 At least….I think I’m not? As a South African, born holding braai tongs, gas grills still just seem wrong. Nice description. Pizza is a fairly advanced technique on any grill, but if you’re going to master it, I think it’s worth the trouble to do it over charcoal. You can really get an authentic “wood fired” taste. We have another version of a pizza recipe on our website which is very similar to yours and really just amplifies what you’ve already said. Google german grill. Thanks. Keep up the good work. We use a gas grill and the exact same method (minus prepping the charcoal, of course). Great detailed instructions, loved your posts and the photos are beautiful as usual! 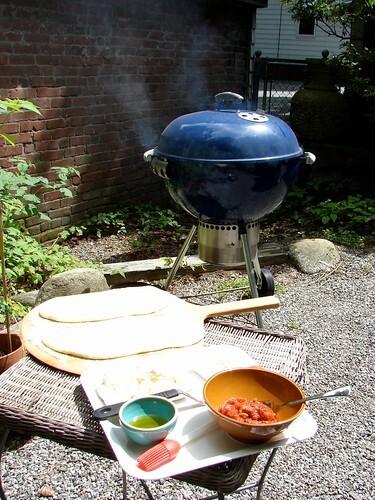 Me, too…..gas grill, same delicious results in a jiffy. I get better every time at my technique and it’s just plain fun! OMG this looks delicious. Has got to be the most tempting grilled pizza I’ve seen around the blogosphere..
Just made this tonight and it was awesome! The charcoal really adds a great flavor w/ the fresh ingredients. Thanks!